(L) Actual photo of the rosary confiscated during a recent infestation case of Libera Nox which, according to Novaliches chief exorcist Fr. Ambrosio Nonato Legaspi, is a“satanic” rosary. (R) When the photo’s levels are adjusted to make it dimmer using an image editor, the supposed Iluminati insignia of the sun with its rays and the snake at the back of the Crucified Christ becomes visible to the naked eye. 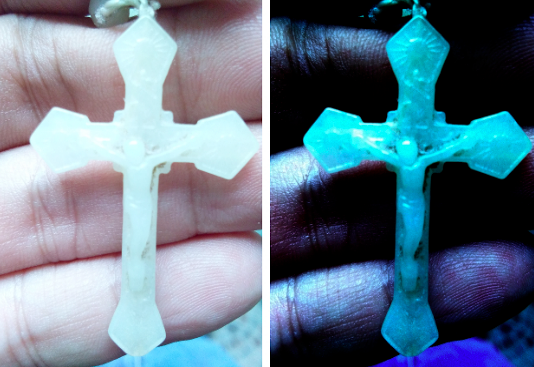 Legaspi warned the faithful about such satanic rosaries that are now in circulation the country. “ listeners, be careful as the rosaries you might be using could actually be infested or cursed,” warned Fr. Ambrosio Nonato Legaspi in his personal function as Libera Nox chief exorcist in the Novaliches diocese. This entry was posted in Devotions, Sacramentals by Julien Laurent. Bookmark the permalink.